July 12, 2017 marked my anniversary for 60 years of active engagement with Catholic Worker communities. On that day in 1957, at lunch hour, I hurried out from my job as a stock clerk at Barnes and Noble in New York City, raced to the Catholic Worker House on Chrystie Street, and, for the first time met Dorothy Day, Ammon Hennacy, and a handful of others gathered there. We went out and sat on benches in the park across the street, in open non-cooperation with a State law requiring everybody to take shelter in buildings when air raid sirens sounded, supposedly training to protect ourselves in case of a massive attack by Soviet nuclear weapons. To us it seemed an exercise in delusional propaganda and social folly aimed at conditioning Americans to the prospect of worldwide nuclear war. Twelve of us were arrested. That night I slept beside Ammon Hennacy on the concrete floor of a holding cell at the “Tombs” city jail in lower Manhattan. The ideas he expounded deeply influenced me toward war tax refusal. In court the next day we were all sentenced to 30 days in jail. At age 20, as the only “juvenile,” I served my time at the notorious Rikers Island prison for youth offenders. So began a lifetime commitment as a recidivist Catholic Worker agitator. A year later, in the summer of 1958, after graduating from the University of Chicago, I started a little storefront “house of hospitality” in a northside slum tenement two blocks away from the Cabrini-Green public housing project. That house ended up abandoned while I was imprisoned in 1971-72 for organizing war tax refusal during the Vietnam War. On January 26, 1960, in Chicago, Eroseanna Robinson, a radical friend of Juanita and Wally Nelson, was carried into Federal Court by U.S. Marshals and ordered to provide information about war taxes she had not paid. She refused, began fasting from both food and water, and refused any cooperation with the process of imprisonment. She was cited for civil contempt, jailed, and, when she continued noncompliance, was sentenced to a year in prison for criminal contempt. I organized a continuous picketing vigil by supporters outside the courthouse for 20 days and nights, and when she was transferred to Alderson Federal Prison in Virginia, I began a series of “jail-in” solidarity actions handing out leaflets at the IRS office, leading to jail terms of three days, 15 days, 30 days jailed for psychiatric examination, and then 20 days. After 108 days of total fasting and noncooperation, Eroseanna was released from prison and I was freed from jail the next day. Deeply moved by the example of this strong and beautiful woman (who was incidentally women’s high jump champion of the United States), I promised myself then that I would never pay federal income taxes again. I began claiming extra allowances on the W-4 Form to prevent withholding of income taxes from my wages, a method I introduced to thousands of Vietnam War tax refusers, through writings in WIN Magazine and the Catholic Worker in 1968-69. I have kept true to my promise for 58 years, and the IRS has succeeded in collecting less than $1,300 from me, by seizure of assets, across all of these years. In 1974 several war resister friends started Francis of Assisi House, a next generation CW community in Chicago. 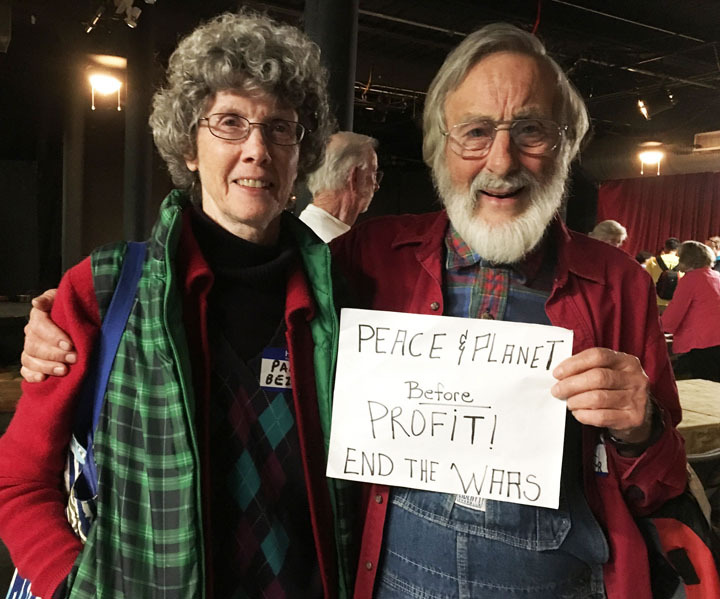 Volunteering in this work I met and married Kathy Kelly, today one of our country’s most outstanding peace activists and a staunch advocate for war tax refusal. In 1997 I settled on urban land in a neglected neighborhood near the center of Nashville, Tennessee. I restored a vacant house and began intensive fruit and vegetable gardening in my yards and the unused lot next door. Our “Nashville Greenlands” community has grown gradually around this first house. Using community effort guided by my skills as a carpenter, we’ve financed restoration of six more vacant houses in our neighborhood, and assembled our current network of seven affiliated houses, with 26 residents. A significant part of the resources to finance our community houses has come from the war tax refusal savings of myself and my current partner, Pam Beziat. We don’t do much direct hospitality for homeless people, but most of our young residents work as staff or organizers for small nonprofits. They do outreach and support services for the most vulnerable homeless people; they gather, process, and distribute surplus food to poor people; they organize mutual support among vulnerable immigrant workers; they organize on environmental, climate change, police accountability, and world peace issues. A warm and grateful tribute to Ammon Hennacy, Dorothy Day, Juanita and Wally Nelson, Marion and Ernest Bromley, and Eroseanna Robinson, those wonderful exemplars of war tax refusal and right livelihood who led me down this revolutionary path. I hope to report to you again at the 68th anniversary of my war tax refusal commitment, and I surely do not expect to pay war taxes when my ashes fertilize the gardens at Nashville Greenlands. In the meantime, I want to visit some communities and readers with a radically condensed version of my 600-page memoir published two years ago, and with a mini “Peace Van,” which I am currently fixing up for limited educational travel. These are two projects I hope to complete in this, my 81st year within our mother Earth. A version of this article first appeared in The Catholic Worker in June/July 2017. Contact Karl at Nashville Greenlands, 2407 Heiman Street, Nashville, TN 37208, 615-322-9523.